(UPGRADE) +50% LUMENS LED PROJECTORS: To meet our customer’s new needs, DBPOWER GP15 was upgraded in 2018 again with 50% more lumens (1800 in total). 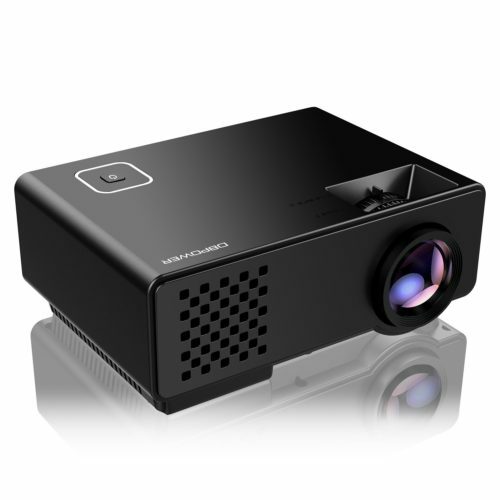 The upgraded projector is much more brighter than other LED mini projectors. You’ll never regret to buy DBPOWER projectors. ENJOY THE BIG SCREEN EXPERIENCE AT HOME: It’s light and with small size, but it has a projection display size of 32-120 inches(with 1-3m projection distance). You could enjoy an awesome viewing experience right at your own home. For optimum viewing, we recommend a projection distance of about 1.5m-2m. IMPROVED NOISE-REDUCTION AND LONG LAMP LIFE: The DBPOWER T22 video projector is equipped with a reduced-noise fan which cuts fan noise by half. In addition, the advanced LED lamp can last twice time than other similar projector. 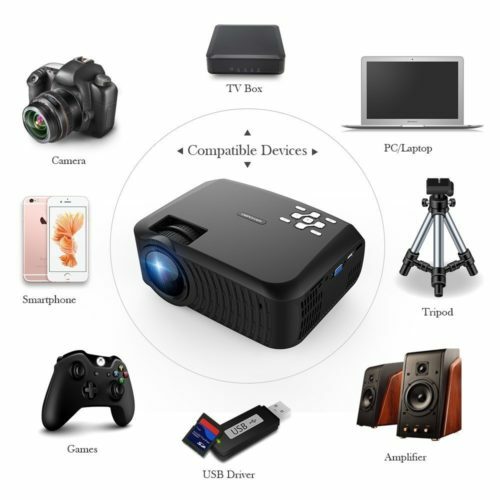 MULTIMEDIA PORTABLE PROJECTOR: DBPOWER projector is compatible with TV Box, Amazon Fire TV Stick, ChromeBook, PCs, Laptops, Tablets, Blue-ray DVD player, SD Card, USB Flash Drive, Media players (Music, Pictures, Video, TXT), iPad, iPhone, Android Smartphones ( an external wifi dongle is needed to connect with phone). LEADING WARRANTY & TECHNICAL SUPPORT: A 3-YEAR warranty with professional customer service & technical support is supplied. We could solve any of your problems, so just try it now. P.S: We do NOT recommended it for PPT or business presentations. 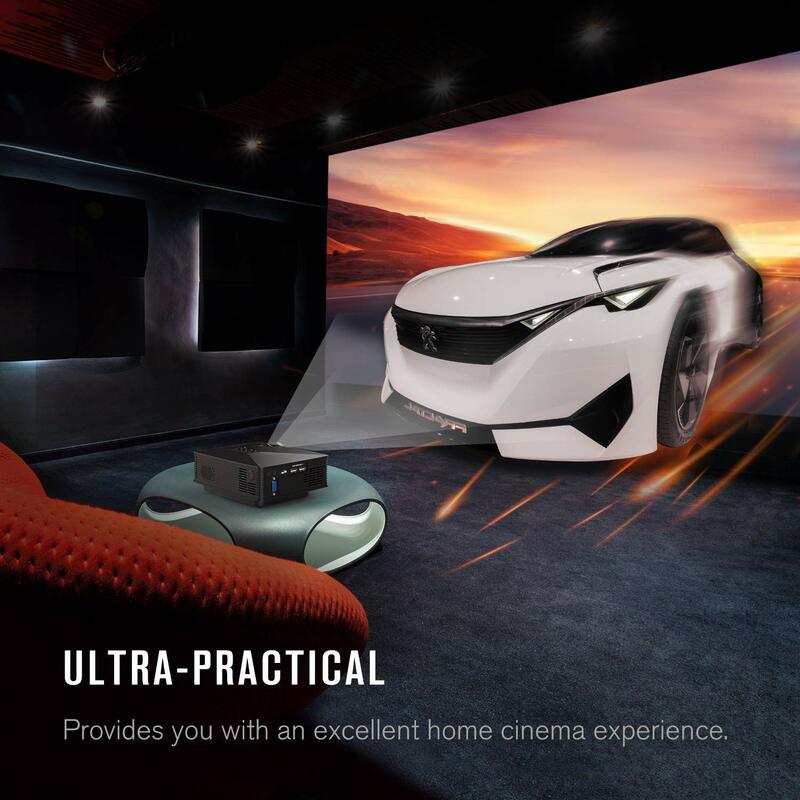 Don’t be fooled by this mini projector’s small size, it actually boasts a huge projection size, giving you an amazing theater experience right in the privacy of your own home. The optimum projector distance is 6.5 feet. At this distance, you will get an awesome display of about 75 inches. *Please use the projector in a dark environment only. We do not recommend it for PPT/Word/Excel or business presentations. *A Wi-Fi HDMI display dongle (not included) is needed to connect the projector with smartphones and tablets. *The projector couldn’t play videos with Dolby sound. *Tripod and Ceiling mount are not included. The light emitted from TVs and computer monitors contains a lot of blue light and invisible ultraviolet light which can penetrate the undeveloped cornea of people’s eyes, causing cellular oxidation of the macular retina. 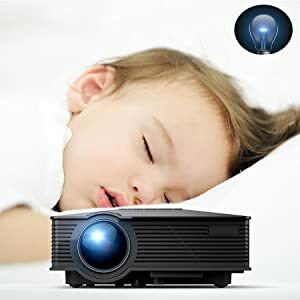 With projector images, it is passive reflection that forms the projection image and blue light gets weakened in the process, which greatly limits the damage to eyes. 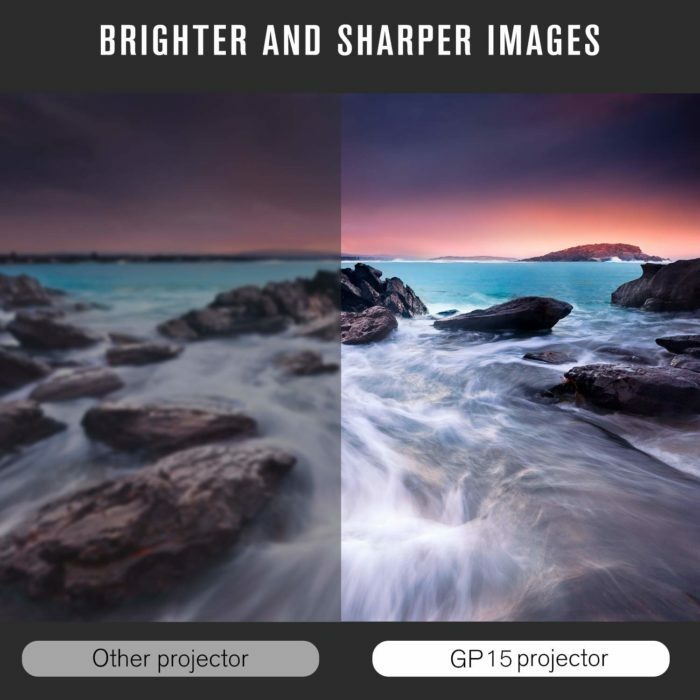 With new led source, 1080P resolution and 1000:1 contrast, this GP15 mini projector will bring you superior sharpness, highly efficient light transmission, low distortion and faithful color rendition. All of which provides you with an amazing home viewing experience. 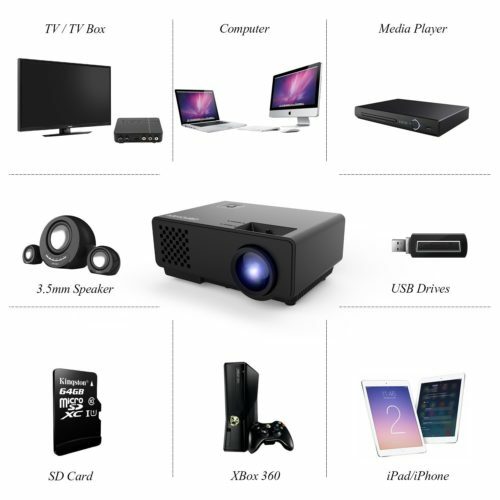 Choose the DBPOWER GP15 projector for the ultimate in home entertainment. The DBPOWER GP15 projector is equipped with an innovative cooling system with reduced fan noise. You can immerse yourself in a movie or game with headphones on and not disturb your family. What’s more, the LED light source consumes less energy than traditional lamp-based projectors and is also mercury-free. It offers up to 50,000 hours lamp life. Question: I know it’s not recommended for power points, but will it work for them? Answer: Yes.you can connect your computer or laptop with HDMI cable(not include) to the projector and play powerpoint. Question: Does this have speakeers? Answer: Yes, it has speakers and a 3.5mm audio output. Question: Can i connect this to my laptop via hdmi and watch movies from external hard drives? Answer: Yes. 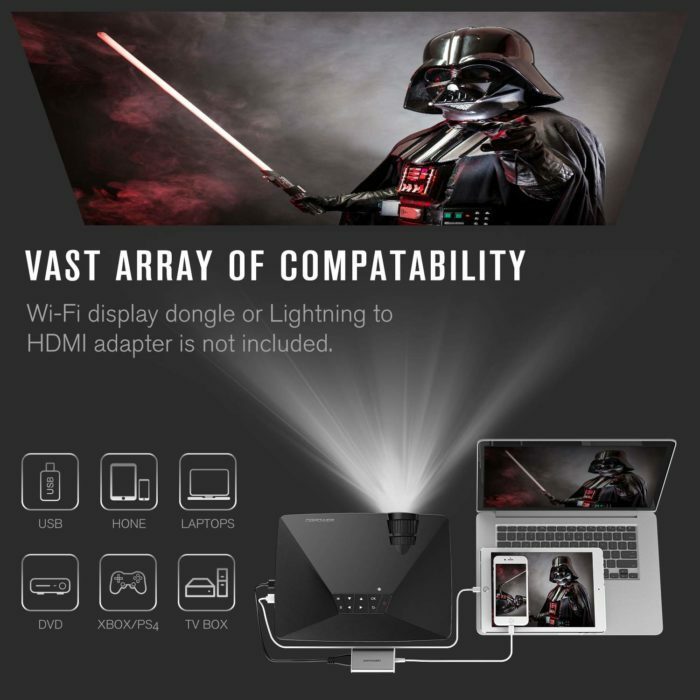 you can connect this projector to a laptop via hdmi and watch movies from external hard drives. Question: Will this have a good picture on a 120inch projector screen? If you want to project it on a 120 inch screen, we suggest you to keep the room in dark so that you could see good pictures. Question: Does it work with a voltage of 220V? Yes, its working voltage is 100-220V. Question: Can i connect this with an hdmi dongle from my laptop? 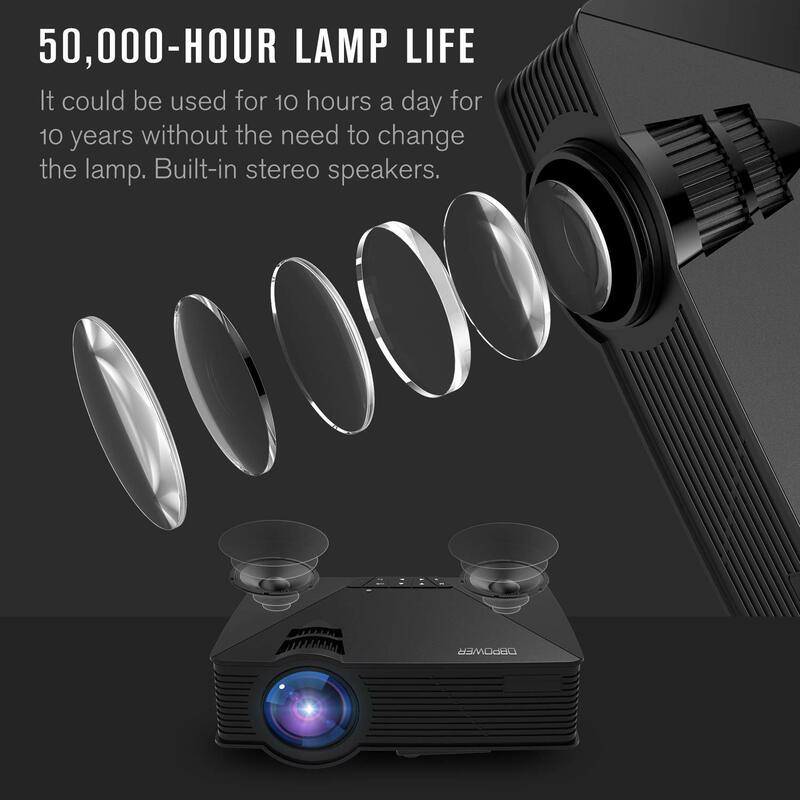 Answer: Yes, you can connect this projector with a hdmi dongle from your laptop or smartphones. Question: Will this work for a single image for murals? For better watching experience, we suggest you buy a screen. But if your wall is white, you don’t need to buy a screen. Question: Is it led or lcd? the title says lcd and the spec pics show it as an led lamp. i’m thinking that one is better than the other. Answer: This projector is LCD displays and LED light source. Question: Does this have a mounting hole to mount on a tri-pod? Also, Can you flip the picture? Answer: Yes,It has a mounting hole at the bottom of the hole to mount on a tri-pod. you can flip the picture by the flip key on the remote control. Question: What is a wi-fi display dongle? A wi-fi display dongle is used to connect the projector to your phone. If connecting with iPhone, a external HDMI to lighting cable needed. If connecting with Android phone, a HDMI to MHL cable is needed. 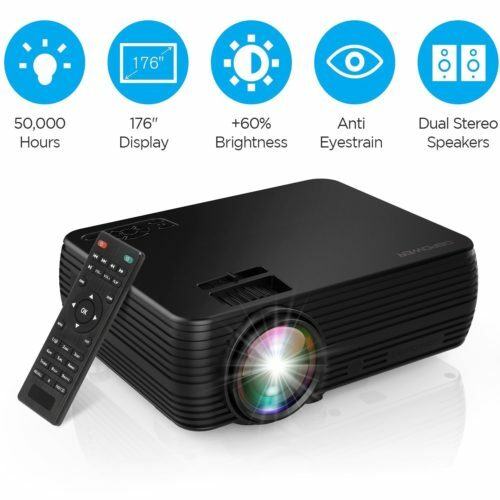 Question: Can i connect my android and apple phone directly to this projector? or do i have to buy a separate cable, if so where can i get it? Answer: You would need a micro-USB to HDMI adapter (android) or whatever it is apple uses to HDMI. Question: Can it hook up to a home cable box? Answer: Yes, this projector can hook up to a home cable box, but you need a HDMI or VGA cable. Question: Is this projector Chromecast and Google home compatible? Answer: Yes you can connect a Chromecast to the HDMI port and use it just like you would with a TV. Customer Review: And it’s a good price! For its price the quality is amazing. Connecting it to my devices was more confusing than I wanted it to be but that is such a slight disadvantage. I love this little projector so much! It’s even smaller than it looks in the pictures but it works very well. The room does have to be dark, but still works if it’s not completely dark. The settings give it quality. It’s not HD by any means, but it still very crisp. Great for movie nights without spending alot. Great for the price! The built in speaker isn’t great, and it takes some adjusting to get a good picture. But once you get you hook up external speakers this is a great purchase. Don’t expect miracles but long as you have reasonable expectations you’ll be happy. The only cord in the box was the power cord. Missing everything else. But I was contacted by the seller and they are making thing right. Great projector, works great. The illumination was better than expected. I thought for the price – how good could it be? but this is a great projector. After a little tinkering with the settings for brightness, I was impressed at how clear it was, and how well it ran. I have 2 speakers and a blu-ray player hooked up to it, and it works great! I loved this product because of how clear and large the screen can get, great quality and amazing for movies. Make sure to buy a separate iPhone to hdmi cable for connecting phone though. This is great if you are using it just for smaller projections. Its not a huge projection, and it can get fuzzy. The colors are absolutely whack. They are very very saturated colors. However, I am just using this for small personal art projects- and therefore, its great for me! Great for what you need it for! 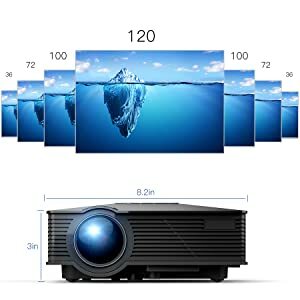 This is great projector! I used it in my wedding!!! very worth it! A little dim for what I needed but still a 5 star item. unfortunately didn’t fit my needs. Price can’t be beat. Image clarity, size, and product features are all just fine, on par with more expensive options. I bought this as a gift for my boyfriend since he kept complaining about how small his TV was. He just moved to an apartment with a large white wall and has been using this little thing for everything! He plugged his Roku stick right into it and hooked it up to his speakers. We’ve been able to watch hours of Netflix without even needing a TV – pretty cool! Know what you’re getting and you’ll be happy. Don’t expect to get an $800 picture out of this. Not bad at all for $50. Picture looks good at 6+ feet away. 1080p content is a little odd shaped, but who cares? This is for slamming up a big picture for a back yard movie night or video game party. For that it’s excellent. For the price you cant go wrong. Its compact and works great. The projector (for the price) does everything we’ve expected. Both my wife and I can use it for presentations to our staff. Very happy with the purchase. This is the first time I bought a projector. I am installing a new movie theater in my house. I have DVD player and wide screen TV but I want the screen to become even bigger. I am happy how well this projector works. It plays movies and displays photos directly from memory cards and thumb drives using its own video and imaging firmware, It also plays movies and displays images from my PC and it works as a monitor for my PC using a VGA cable. It works brilliantly. The color and resolution is perfect, and so much better than I expected. The LED lamp is shock proof and has a long life. It has an ultra low energy demand and the LED lamp is so much better and runs so much cooler and quieter. 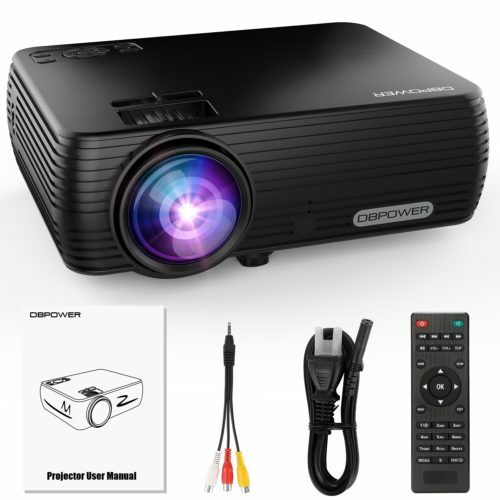 I am really impressed with this projector and hope to get some outdoor use out of it while on camping trips. I connected the projector with my home theater system and the sound is very clear. It is a great convenience having it. Good product. It was an impulsive buy. Did not realize until after I tried to use it, that an adapter is need to connect my phone to it. It could be the box and table I had it sitting on, but it is also somewhat difficult to focus. I could either get the top or the bottom half focused, but not both. I purchased back in November 2017, tried it out that one time and it has sat in the original packaging since. Very happy with this purchase! Our first projector and we are super happy with it. 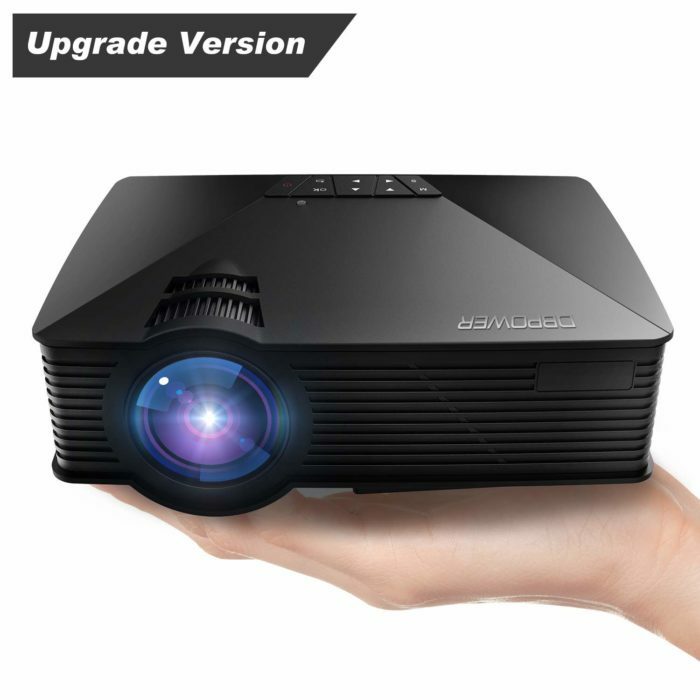 It is a good projector for watching movies in Dark room. Need to have separate sound system for theatre experience. Perfect for our in home needs. We have movie nights in our bedroom and set up is a breeze with a firestick. Update. Customer service is outstanding and really reached out to ensure they could do anything possible for customer satisfaction. Great company to do business with. 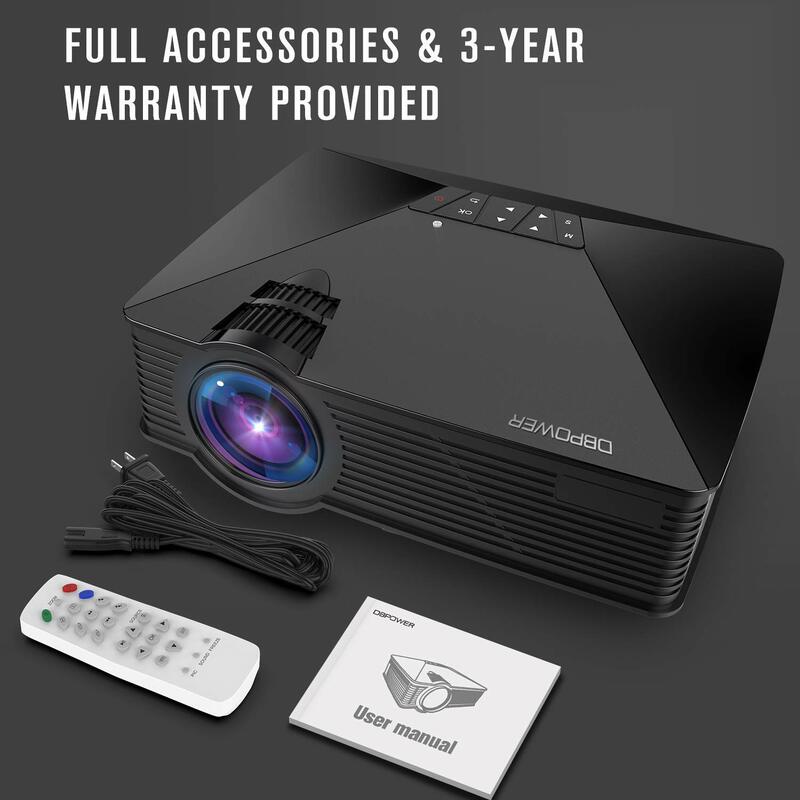 Pretty good projector for the money. It’s not as bright as I had hoped for but again for what it costs what do you expect. I wouldn’t use it for an everyday projector but for movies in backyard it should suffice. Perfect for turning a smaller room into a little movie theater! Good quality and good service! I bought this portable projector for group meetings three weeks ago. 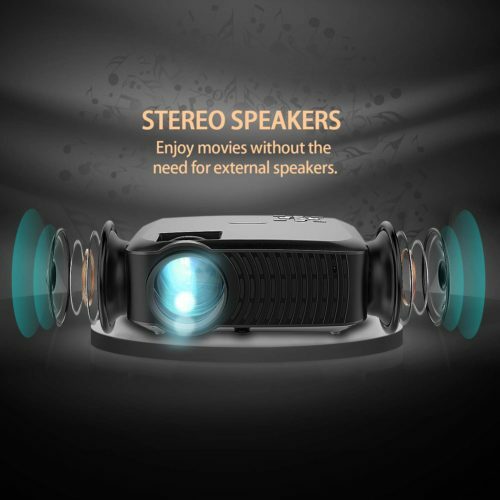 This is a wonderful projector, with options of showing contents (Videos or pictures) from PC, USB or SD card. It also comes with a HDMI cable. The projector is very easy to operate. The service is also wonderful. I received a free carry bag about two weeks after the purchase. I definitely recommend burying from this company. Decent for what it is. UPDATED: I have updated my review after using for six months. I’ve found quite a lot of uses for this, but love it best to show photos at parties and short video clips. 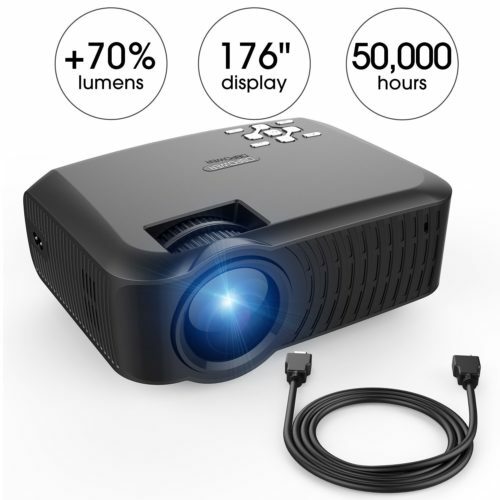 This is a great portable projector for darker areas with a white backdrop. The product itself works nice if you are hoping to watch some movies or videos in lower quality than your tv. For my purposes of watching some movies with friends in a dark basement this device does really well. For the most part the picture is good enough to be enjoyable. Some shows it can look like the contrast is too high no matter the picture setting. 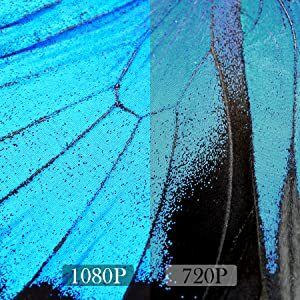 If you are wanting a hd picture with great sound this isnt for you. It is more for a casual night out, showing off some home videos, or great for holiday displays. I don’t use the built in speaker, i prefer an external speaker. Well built and quite, has good image quality for the price and seems like something that’ll last. Has worked wonderful for playing movies from my iPhone and iPad! I bought an Apple HDMI to lightning adapter and have not had any connectivity or display issues. I was pleasantly surprised how loud the speakers are! I didn’t even connect my external speakers when I played a movie with a small group of people in a medium-sized office. 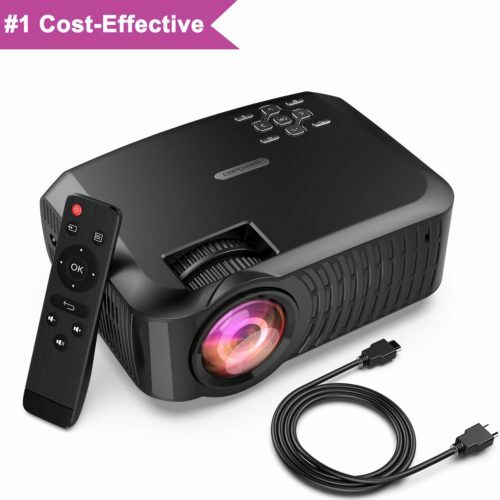 I love how small and portable this projector is and I got a great deal! 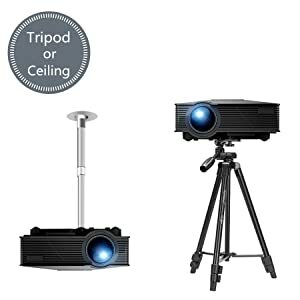 I also ordered the blue and I think it’s still professional looking and there’s no mistaking that it’s my projector. I really like this projector! Portable and easy to use. For the price is a great buy, it has a lot of accesibility options for a cheap price. Nice and sharp image in no so dark rooms. Reason for low stars: IT COMES WITH SPECIAL PROMOTION: free USB or carring bag if you register. (Clearly said No amazon review required). But email person ask to send screen capture of review in order to process gift)… ¡!!! I have used this just once, but it worked well. I haven’t figured out all the inputs yet, but the HDMI option worked fine for my presentation. The product arrived timely and was well packaged. It was easy to set-up and the picture is very good, ,especially for the price. The small size makes it easy and convenient to move. we have used it with several different sources and all worked very well. Considering buying more for gifts for our family and friends. Highly recommended. I bought this for my dorm room, and it works great! An absolute must have for a college student looking for the ultimate gaming/movie experience without breaking the bank! Works well! it is difficult to fully focus but not so bad it is very noticeable. A better sound system would be great as well. I purchased this because it was on sale, and I don’t regret it. It serves its purpose and is overall pretty good. It makes an obnoxious buzzing sound when you first turn it on, but it goes away shortly thereafter. The volume is good for a smaller space, but I have it connected to small speakers to amplify the sound a little. 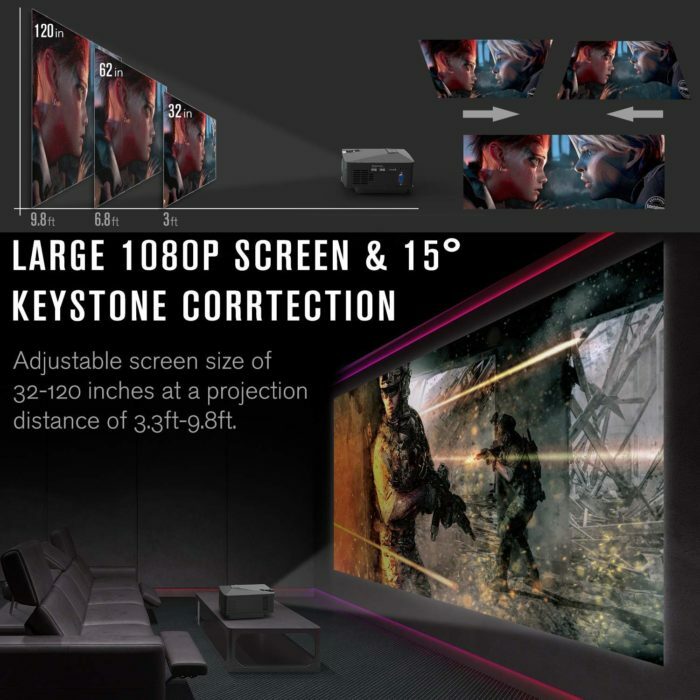 The screen quality is fair, and can be adjusted to accommodate the size and distance of the projection, but do not expect perfection or top of the line. It is clear enough though. Price-wise, it’s a decent purchase and I appreciate that it takes up very little space. Haven’t used it yet but looks good and has enough inputs to show movies. Compact and easy to use. Nice remote that makes it easy to even watch mp4 movies without a program on a USB. This is a very practical compact light projector with multiple input modalities for most projects. Price was appropriate. Packaging was very good. I was looking for this product for years. 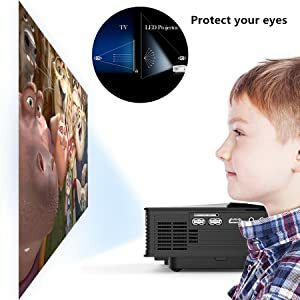 For the money this is a nice projector for my daughter to use. I set it up with a chromecast attached. She uses it to watch Netflix and other items from her iphone.